What We Do - Southwark Metal Mfg. Co. Since 1946, Southwark Metal Manufacturing has established itself as one of the largest manufacturers of HVAC sheet metal pipe, duct, and fittings for residential and light commercial applications. Southwark Metal exclusively services wholesalers, with over 500 distributors currently stocking our products across the United States. All Southwark products are designed and manufactured for use within forced air systems, providing effective distribution of conditioned air from the air handler to every room of a residence. Our metal duct and fittings are constructed from hot-dipped galvanized steel. Each of our divisions holds approximately four to eight million pounds of steel in stock, or anywhere from 500 to 1,000 coils on the production floor. Our steel inventory makes it possible for each of our facilities to meet our customers’ largest order requirements as well as allows each division to replenish stock seamlessly for constant product inventory. All Southwark metal products are made true to gauge, with no “lite” or “standard” gauge product offerings. Our sheet metal duct, pipe, and fittings are designed with industry and regional standards in mind, as well as ACCA and SMACNA recommendations and requirements. Our products are hand-crafted to reduce noise and friction and constructed to maximize efficiency by increasing airflow without leaks. The quality of our galvanized steel allows us to create fittings that are rust-resistant and durable. Our six facilities use state-of-the-art manufacturing equipment to create over 3,000 stock items, including metal pipe, elbows, register boots, collars, reducers, wyes, tees and more. Our highly trained production staff can also create custom fittings, including specialized OEM products, that can fulfill the most exacting requirements of all our customers. In order to better support our customers and employees, Southwark constantly invests in new equipment and continually upgrades our plant facilities, manufacturing processes, and customer service offerings. 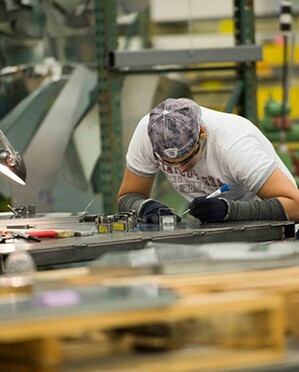 Our production departments work with lean manufacturing techniques for streamlined and safety-conscious production methods, reducing scrap and increasing efficiencies, to ensure high quality daily production standards. With over one million square feet of manufacturing and warehouse space across the nation, Southwark Metal has the ability to fulfill your large volume orders from our inventories without long lead times. With over six decades of experience in the HVAC industry, Southwark Metal is proud of our reputation of integrity, reliability, and value in the manufacturing of sheet metal ducts and fittings. Our experienced employees have a long-time understanding of the marketplace and their steadfast work ethic and dedication to assisting customers in any way they can have long made them our company’s greatest asset. Southwark Metal is dedicated to the growth and success of our customers, vendors, and employees. We have been recognized by various industry organizations for our ability to grant the highest value to our customers above and beyond just providing high quality sheet metal ducts and fittings; Southwark Metal is proud to accommodate our customers every day, delivering superior service and incomparable support.